Re: What is your favorate Loco; Post a Pic' & tell us why. 5 DASH 9's???!!! Wow! I figured that was 5 SD40's or 45's. I like the Union Pacific Big Boy. Here are some facts you might not have known. A Big Boy boiler is about 60 feet long! A Big Boy is almost 20 feet high! 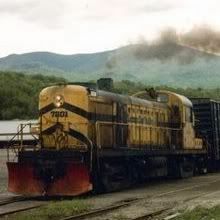 I have only ever seen one, at Steamtown..impressive machines! My mistake the firebox was 20 feet long. Diesel - Almost any first generation engine - especially Alcos. The seem to have more personality the the new brutes. 3713 is a P4 pacific and 1455 is a B15-b mogul. Wonderful model of the Flying Scotsman. I knew he was going to York awhile back my uncle in Grimsby UK keeps me updated, I was very impressed with the National Railway Museum at York. My Uncle had to drag me away especially when I saw the huge Chinese Mikado built in Warrington England. he has given almost 5,000 pounds in our names for her restoration and I hope if my health lets me to return again one day to see the ole boy in all his glory. To be honest I don't know which was worse him trying to drag me away from York or the Naval Base at Portsmouth and HMS VICTORY and HMS WARRIOR in all it was a grand month in 2001 and the Fish N Chips I do miss greatly. ok seasalt...since you wont make a thread for steam locos only i did it, so now you wont be so flustered and mad when people post pics of non steam powered stuff.....enjoy and please try to have a nice day. LD303 : I am surprised that my, "I was hoping this string would be for Steam only" should raise such uglyness from you to usher me off my own thread. You have your diesel postings: I was trying to raise the education from you to give us all more than just pretty pictures. Phoenix AZ: OO enthusiast modelling GWR 1895-1939, Box Station Wiltshire; S&DJR Writhington Colliery, Nr. Radstock. Interested in making friends on the site with similar interests. We all humbly apologize for not being as educated and sophisticated as you. We shall endeaver in the future to live up to your high standards. We should realize that you, being part of the educated elite, know what is good for us, much more so than we could ever hope to know on our own. We can only hope that one day we are half as smart as you. Now that my tonge is out of my cheek, that is the rudest, most insulting, and condescending thing I have ever read on this board. How dare you look down your nose at people just because they don't like what you like or because you don't think what they like is important. You owe LD303 an apology - big time. I don't see LD303 telling you to leave Seasaltchap, after reading the other posts and your apparent anger over non-steam locomotive postings, the addition of a steam only thread seems like an excellent idea. Why are you so angry? Also.....you posted a picture of some type of old European steam locomotive,which apparently they only made 3 of? and that makes it totally un-noticable and without any historic merits,none of the modellers I know are even remotely interested in anything from ''over there'',....you provided little information on it....no specs. and a very limited history, so how did you raise anyone's education level? you didn't ask for histories or specs. in your thread title, just a ''why do you like it'', and from what I read, everyone told why they like their particular subject.... you really should have made the title of this thread more explicit. LD303 made a thread for steam only and you criticized him for doing so, why? you should aplogize for being so rude and condescending. JM : Plainly your view is not supported by those on this thread, who are interested in all things "Trains". It is unreasonable for you to expect to blinker the rest of us. I think you need to explain, where is the anger. This thread has happilly evolved to include Diesels and Electrics, I particularly like the Pennsylvania GG: worldwide it could be the trademark of the Pennsylvania, that is how well it is known as an image. A new thread "Steam .........." could equally have been "Diesels ........", such is the arrogance of some of you. Sheldon : Education - Educo, leading out. I want to learn from you and LD303 more than just pretty pictures. The "Why" has to have some substance to interest me and others who are contributing to my thread. OK, to get even more technical about the diesels I mentioned, the GM 567 diesel prime mover was a major break through. It used interchangeable parts, to make 6, 8, 12 and 16 cylinder versions, and its mechanical supercharger provided as much HP as all the competitors turbo chargers with NONE of the maintenance problems. A replacement engine part, almost all the parts infact, for a 1500 hp, 16 cyl prime mover in an F7, where same as those for the two 1000 hp, 12 cyl prime movers in an E7 or E8, or the 600 hp, 8 cyl in an SW600. The shop had to love that idea. Electrical gear, trucks, traction motors, etc, had similar levels of interchange. Each new improvement in HP was, for the most part, retrofitable to older models as they where rebuilt, either by the railroad, or traded in to GM. That all sounds like reduced operational costs, lower prices to customers and more money in the bank. These facts kept the railroads in business. And in the US, at that time, they where just that, a business, not a state run charity like most of the railroads in may other parts of the world. What view are you referring to? I simply stated a known FACT,I answered what YOU posted. Twice you stated this thread was suposed to be steam only, and now you say you're ''happy'' it includes diesels? then why are you so miffed at the diesel picture posts? Also, what ''arrogance'' do you speak of? LD303 made a steam only thread to try and placate you and you call that arrogance? it seems to me that YOU are the arrogant one. As I stated...NONE of my railroad modelling friends are the slightest bit interested in anything from Europe, you call that being arrogant??? Sir, you are the arrogant one and you should immediately apologize to ALL on this board. Sheldon has provided you with specs. and history......now it is time for YOU to provide the same about your posting of that obscure European tea kettle. Just stop bickering. This is getting stupid. Note the "I do not need this lecture" thread has been deleted. This started out a fine thread.... Now it's starting to look like " I do not need this lecture II"